Unable to check for failed actions. : DBManager.IManageDB.1 : Cannot open database "ADMT" requested by the login. The login failed. Run the installer and select New SQL Server stand-alone installation or add feature to an existing installation. 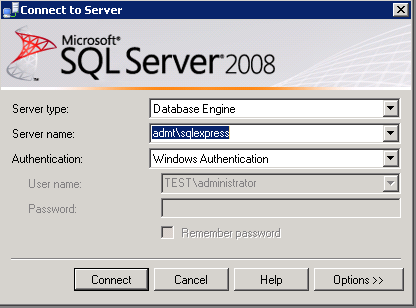 Choose Add features to an existing instance of SQL Server 2008. Select Management Tools – Basic (it’s greyed out here as I’ve already got them installed). Follow the rest of the installation through, when complete run the SQL Server Management Studio and connect to the SQLEXPRESS instance. Select Security, Logins and choose New login. 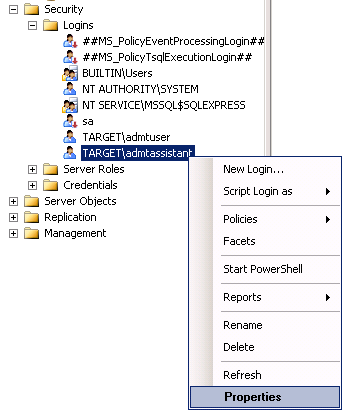 Add the account that needs access to the ADMT MMC Console and select Windows Authentication. You can see the user added, right click and select properties. Select User Mapping, tick ADMT and give the db_owner and public role membership. The user will also need to be local administrator on the ADMT machine. You should now be able to open the MMC console.